Welcome to the SalesHood November Release! We have some exciting things coming this month, let’s get started. This release we focused on building functionality to enable Managers to easily see the activities they need to get done in SalesHood. Coaching Activities allows them to view, complete, and be notified of the various assigned activities. For this release, there are 3 different activities: Grading a Test, Reviewing a Pitch, Watching a Story. 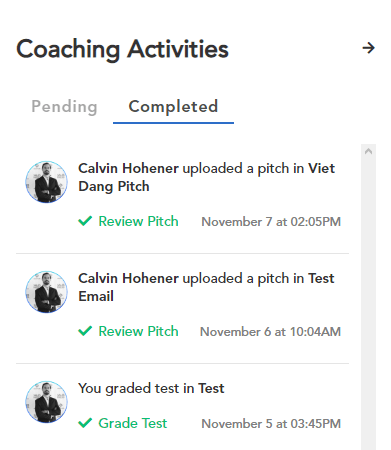 When a member of your team submits a test, pitch, or story you will now be notified within SalesHood to grade, review, or watch. These activities are housed in a panel accessible everywhere in the platform by selecting the megaphone icon in the nav bar. Within the panel, activities are split between “Pending and “Completed”. Pending activities are listed in chronological order (recent to oldest) while Completed activities are listed by completion date (recent to oldest). When you select an activity it will take you directly to where you need to complete the action. 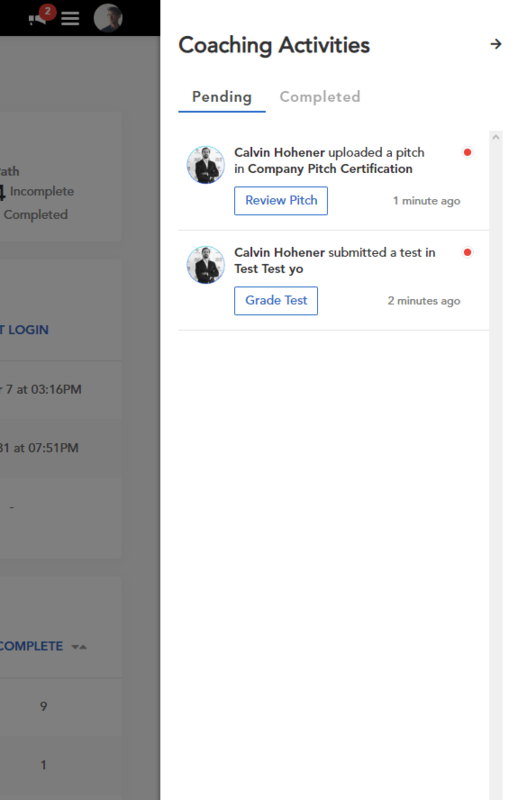 For example, if you select a pitch activity it will take you to the review page of that person’s pitch. 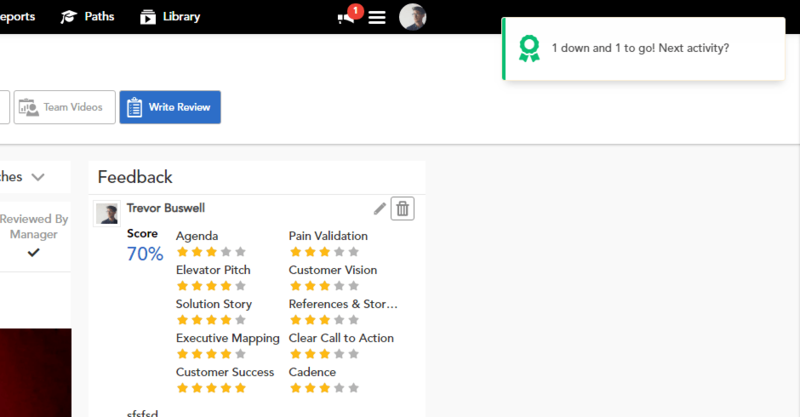 Once you finish reviewing that pitch, we will notify you of the next activity automatically. After all activities are completed, we will notify you of a job well done! You can also find completed activities in the “Completed” tab in the Coaching Activities panel. Here you can also click to go back and review past tests, pitches, and stories. Every week we will send an email that updates you on all the pending activities you have in SalesHood. From the email, you can see who has activities to complete and directly access the Coaching Activities feature. All the functionality listed above will also be on mobile for Managers to view, complete, and be notified of Coaching Activities. Now it is easier for field Managers to provide coaching for their team while on the go. If you have Company Theme enabled for your instance, we have replaced the SalesHood logo with your company logo for all emails sent from the SalesHood system. If you don’t have Company Theme enabled, contact your Sales Director for more details and learn more here. Per customer feedback we improved our SalesForce Content Management App this release to allow for more variation in multi-select pick lists. Stay tuned for our upcoming releases as we are working on Partner and MicroSites functionality that many of you have requested. If you have any feedback or questions please email support@saleshood.com. Thank you to everyone who gave us feedback as it helps us build better features for SalesHood!